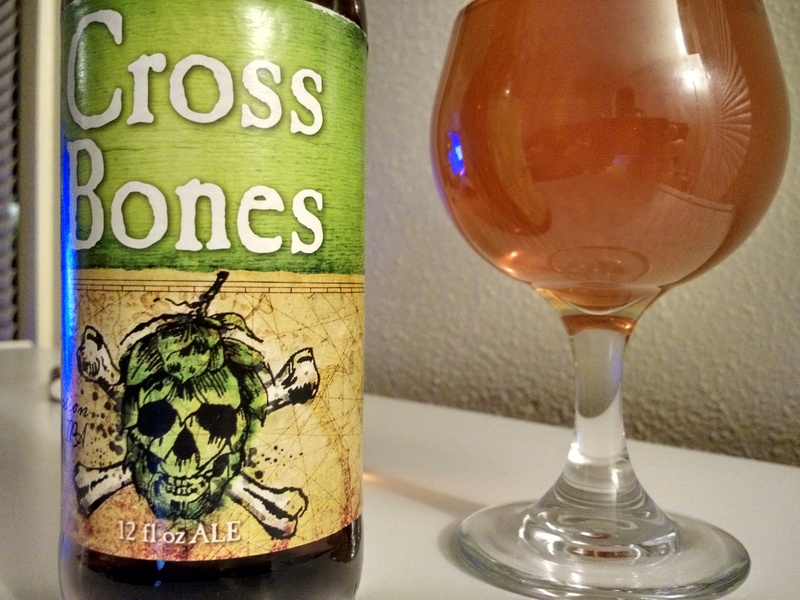 Cross Bones – Heavy Seas Brewing – Did X mark the Spot? Every year it seems that more and more breweries are putting out what is somewhat of a confusing style – Session IPA’s. I’m not sure that anyone really could distinguish the difference between a Session IPA and an overly-hopped Pale Ale, but one thing is for sure, they are extremely in vogue. 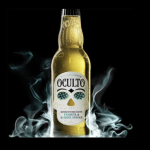 One thing that is not up for debate is that when brewers try to make lighter beers have the flavor of fuller beers they often miss. There are plenty of great Session Ales out there, but there are just as many “meh” sessions as well. 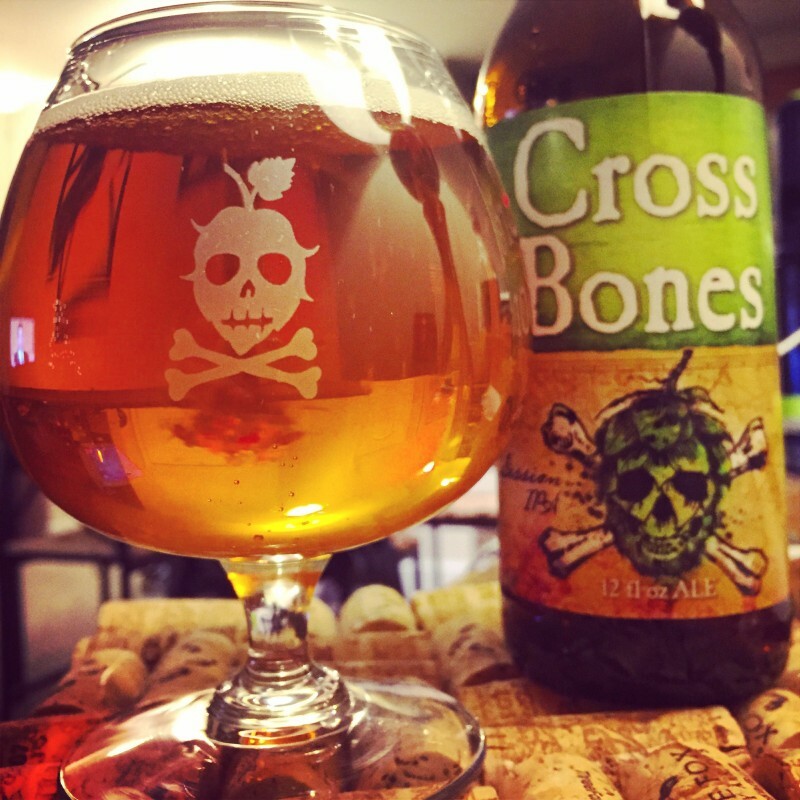 Heavy Seas is hoping that their newest year-round release, a session IPA called Cross Bones, tastes more like a hidden treasure than it does the poop deck. While I may complain about the semantics of a session IPA, I have the highest hopes Cross Bones is going to be the perfect combination of low alcohol and high flavor. I think the most surprising thing about Cross Bones’ appearance is that it doesn’t look like a lighter beer. It is a great, malty-amber color that could be just any ol’ IPA. It does have a slightly more yellow or straw color than a normal IPA or Pale Ale, but in a dim0light scenario you’d never be able to tell the difference. What makes it look light in any circumstance is how clear it is. 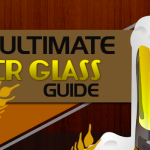 I mean this beer is clear as glass! I can read what I’m typing through my glass of beer. I don’t want to insinuate that breweries sometimes embellish the aroma profiles of their beers, but Heavy Seas completely nails the aroma descriptors on their site. Cross Bones isn’t too pungent, but the aroma that is there is fresh lemongrass, grapefruit and lemon zest, light pine, and a bouquet of floral aromas. Again, nothing in the aroma is smacking me in the face, it’s delicate, airy, gossamer; just like the idea of a session ale, it’s complex but light. Cross Bones is almost prickly. The first thing I notice about the mouthfeel is that it is highly carbonated, but it is a harsh carbonation. The bubbles fizz and pop throughout my mouth, almost feeling as if it is trying to clean my gums. The body is on the thinner side, and I think the carbonation is to make up for the less-than-perfect body. At first, I found that Cross Bones was refreshingly bitter. Upon second swig, I think it might be aggressively bitter. Maybe that’s their way of distinguishing this as part of the IPA category, but I feel like so much hop flavor is lost in favor of hop bitterness. I know that may be some people’s preferred flavor profile, but it’s not mine. Once I allow myself to get used to the bitter aftertaste, I can pick out grapefruit, lemon zest, and a light flowery flavor. Then, after finally getting some hop flavor out of this beer, it all turns into a one-note band. Without something in between sips to change up the flavor, the complexity of Cross Bones suffers greatly. So was Cross Bones the perfect session IPA, or did X miss the spot? I’d say somewhere in the middle. This isn’t a bad beer by any means, but it just didn’t resonate with me in the same way that a hoppy pale ale would. The body is a bit too light, and the hops are a bit too bitter. That combination adds up to a beer that gets an 85 from me. As a session IPA, it did what it aimed to do, but I just wish they spent more time worrying about late hop additions to give it more flavor, and not such harsh bitterness. It also lacked the complexity that other session ales have proven is possible to have. I do give Cross Bones some credit though, it’s a flavorful, light IPA that can quench your thirst with the best of them.